How pumped are you for the Super Bowl? It's going to be a bit of a somber occasion around here since the man is a Pat's fan and... well... you saw what happened. 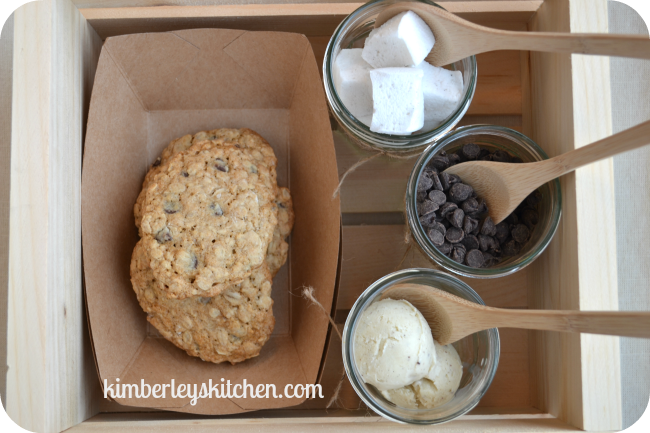 Thankfully Kimberley from Kimberley's Kitchen - my number one marshmallow destination - has her game face on and is fully prepared with these amazing Superbowl Ice Cream Sandwiches. Have you meet Kimberley before? She makes incredible artisan marshmallows and confections. She's passionate about quality food and the environment, and all her ingredients are simple, often local, organic and fair trade certified. 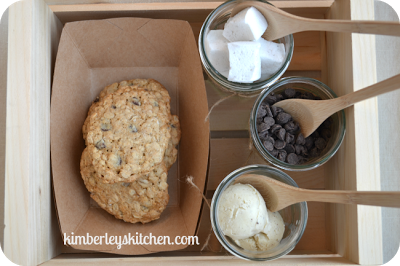 Ice cream and chocolate chip cookies. Two of my favorite things. So, I thought, why not put them together and make the ultimate Superbowl treat for our annual party! Superbowl is a big deal in our house. We spend months planning our menu; long before we know the teams in that final game. And if it happens to be two teams we like, or even just one, then all the better! However, this year is shaping up to be two teams we don't particularly love (sorry!) so we are planning a fairly neutral color palette and putting away all of our Saints memorabilia. I was trying to think of a hand-held dessert combining my two favorite foods and then it hit me- Ice Cream Sandwiches! Who said they are just for summer? My epiphany came to me after I made a batch of the BEST HOMEMADE ICE CREAM EVER! Okay, I know that I am not the first to make homemade ice cream. But trust me, if you haven't tried it, you are missing out. Of course, this recipe would work just fine with your favorite store-bought. But homemade really isn't too difficult or time-consuming so why not try it? 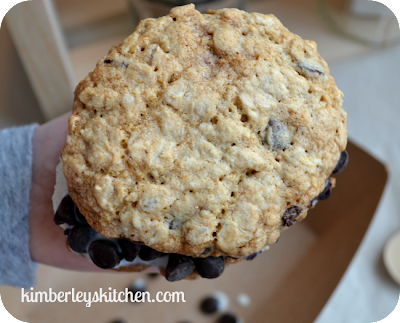 I started with football shaped cookies made from my Favorite Oatmeal Chocolate Chip recipe, which I am sharing below. But you could use any cookie recipe that you love- chocolate cookies, sugar cookies, you name it, it would work just fine. I then added my homemade Vanilla Bean Ice Cream. Again, go with your favorite flavor. I then added a few mix-ins. I am all about the mix-ins. Here we have simple, humble chocolate chips and some handmade marshmallows (to be fair, I add marshmallows to just about everything). And voila. 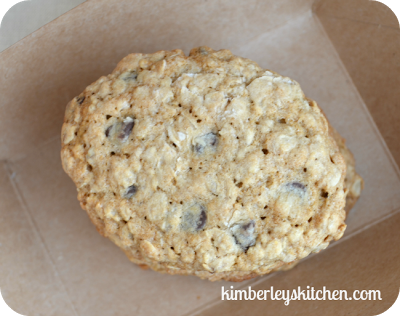 You have a Superbowl dessert that is fun, interactive, and destined to be a family favorite. 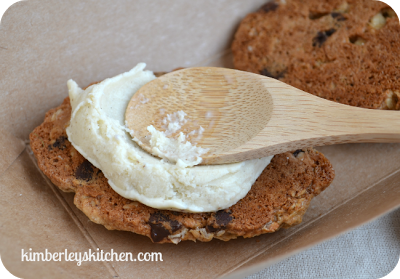 · Remove from oven and cool on a rack; stored in an airtight container these cookies will stay fresh for several days, but they really won't last that long. Homemade ice cream tends to be softer than store-bought, making it perfect to press into ice cream sandwiches. 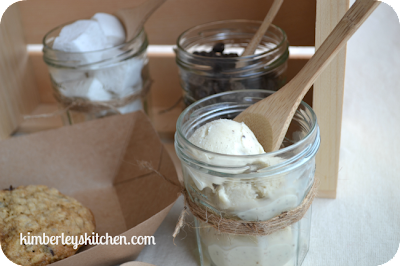 To assemble your Ice Cream Sandwich station, stack cookies (make ahead for easier prep), jars of ice cream with large spoons to smush it on cookies, and an assortment of mix-ins. Perhaps some napkins would also be a good idea.